As a "gracious host", India extended all facilities to Sartaj Aziz for his trip to Amritsar to attend the Heart of Asia conference and there was no reason to complain, government sources said on Monday, a day after Pakistan claimed that restrictions were put on his movement and he was not allowed speak to media. The sources also said a rare exception was made to allow arrival and departure of Aziz, who led the Pakistani delegation, by air at Amritsar which is not a designated port for entry and exit of Pakistani nationals, besides giving swift clearance despite a last minute change in his scheduled arrival by a special flight. In a hurriedly called press conference after his return from Amritsar last night, Aziz had accused India of not treating the Pakistani media properly at the Heart of Asia meeting and said he was not allowed to have a press conference. "The attitude towards media was not good. I wanted to have press interaction with our own media. But we were not allowed," he alleged. 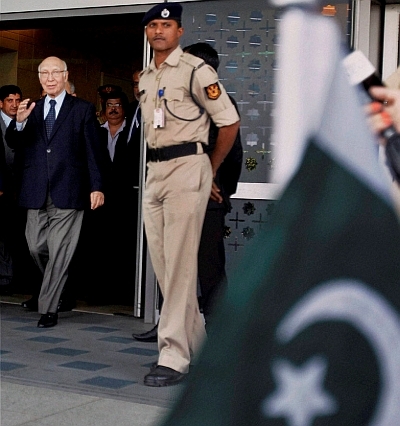 On Sunday, Pakistan had also claimed that Aziz was not allowed to visit the Golden Temple and speak to Pakistani media at the hotel where he was staying even as India said it was done considering his security. "They have no reasons to complain. We were gracious hosts. Extended tarmac access, gave additional rooms, provided armoured cars (not given to every foreign minister) and other conveniences keeping special security requirements in view. "This was done despite the last minute change of programme and advancing of arrival in Amritsar by special flight by more than 12 hours. Fresh flight clearance was issued within minutes," the sources said. They said Aziz could be present in the official dinner and in the call on Prime Minister on the evening of October 3 due to the last minute clearance given. "In addition, they were actively engaged in the Senior Officials Meeting and Ministerial and all other requests honoured. A rare exception was made to allow arrival and departure by air at Amritsar which is not a designated airport for entry and exit for Pakistani nationals," they said. India's efforts to "spoil" Pakistan-Afghanistan ties will not succeed, Sartaj Aziz said as he downplayed Afghan President's criticism of Pakistan's support to terrorism, saying it was meant to "please" India. "Ashraf Ghani's (Afghan President) statement is regrettable. It shows anxiety in Kabul and is understandable due to deteriorating law and order situation," Aziz said, adding that Ghani's "statements were meant to please India". He said India's efforts to divide Afghanistan and Pakistan will not go far as "we are next-door neighbours". "Indian efforts will not succeed to spoil Pakistan ties with Afghanistan, as our ties are religious and cultural. That is why we want that terrorism should end in Afghanistan," he said on returning home after attending the Heart of Asia meeting in Amritsar. "But our ties with Afghanistan are independent and we need to cooperate on several issues," Aziz said. He claimed that India was trying to use Afghanistan for its own advantage "but it will not succeed". Afghan President Ghani had accused Pakistan of launching an "undeclared war" against his country by covertly supporting terror networks including the Taliban, and asked it to use its $500 million aid to check extremism on its soil. He had also demanded an Asian or international regime to verify Pakistan-sponsored terror operations. Aziz said Pakistan had reassured Ghani that its territory will not be used against Kabul. "I reassured Ghani that we will not allow out territory to be used against Afghanistan. But also emphasised better border management," said Aziz. Aziz said the Afghan leader had a different idea about $500 million assistance pledged by Pakistan and proposed a trilateral commission with China to utilise the amount for welfare of Afghanistan.